A short film highlighting the work undertaken by the Southern Highlands Koala Project Team protecting our local koala population. Sustainable House Day, onSunday 13 September 2015, is an international event where people who own houses that are doing good things with materials, energy, water and food, are opened up for any interested visitor to have a good long look at – to poke around, ask questions, and see for themselves. Environment Minister Mark Speakman has invited community organisations and councils to apply for a share of the NSW Government’s $5.3 million Restoration and Rehabilitation Grants Program. Mr Speakman said the Environmental Trust Grants Program aimed to help community organisations, local councils and other groups run projects that would prevent or reduce environmental degradation at a local level. “These grants will help communities and organisations conduct important environmental work in relation to vulnerable ecosystems,” Mr Speakman said. “The government has set aside $5.3 million for this year’s grants program for projects working to conserve and restore our natural environment. 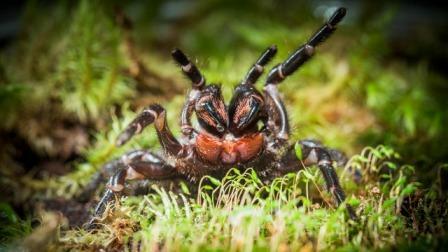 "It may even turn out to be a new species of funnel-web," said Dr Wallenius, a biologist in ANU Research School of Biology. Celebrating National Threatened Species Day 2015, the NSW Office of Environment and Heritage today launched an online survey tool making it easier for communities to record sightings of the Superb Parrot, one of the state’s most magnificent, but threatened bird species. 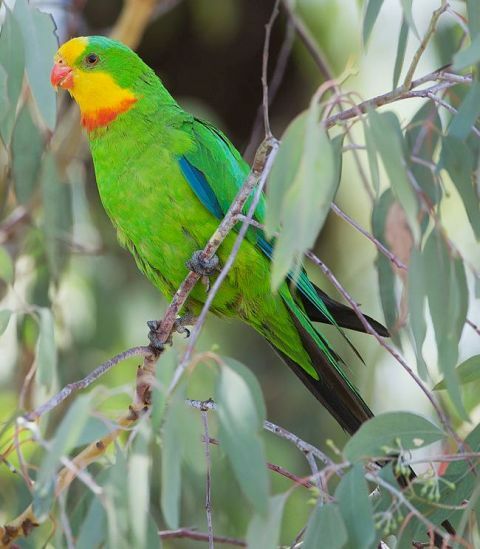 Ian Hunter, Deputy Chief Executive said the Superb Parrot Community Monitoring Program started two years ago as a community-led initiative in the small town of Boorowa where volunteers conducted field surveys each Spring. “There are only 5,000 known breeding pairs of this bright green parrot left in the wild,” said Mr Hunter. “Mainly found in NSW’s South West Slopes, the Superb Parrot is also known to occur across the Northern Tablelands and Riverina districts. “Creating an online survey tool is a way for the wider NSW community to record sightings and other relevant data on the Superb Parrot that will ultimately be used to make conservation decisions for its survival. “The data collected through these surveys is invaluable to the NSW Office of Environment and Heritage (OEH) as it records the abundance and distribution of this threatened species on private land, data that has not previously been recorded. “Data captured through this new online survey tool will go straight to the Atlas of Living Australia and be shared with the BioNet Atlas of NSW Wildlife that is used to make planning and assessment decisions. “The new tool will create a network of observers and records so we’ll have a clearer idea of how this species moves across the landscape, where it nests and breeds and population trends overtime. “Community sourced data will greatly enhance existing data sets and drive management actions for this species under the NSW Government’s flagship Saving our Species (SoS) Program,” Mr Hunter said. SoS aims to secure the survival of close to 1,000 animal and plant species at risk of extinction in NSW and another way that people can get behind the program is by purchasing the 2016 SoS calendar, on sale from today. The calendar features the Superb Parrot and 12 more photos of some of NSW’s most iconic threatened species including the brush-tailed rock-wallaby, koala and southern corroboree frog. “Expanding the Superb Parrot Monitoring Program demonstrates how a community-led initiative and affection for this impressive bird can grow into a state-wide citizen science project that gets people out and involved in protecting threatened species in their local area,” Mr Hunter said. A new zoo in Sydney’s west could soon be a reality after the NSW Government approved the lease of a 16.5 hectare site in the Western Sydney Parklands. Adjacent to Bungarribee’s new picnic area and playgrounds in the parklands, the zoo will provide family fun, recreation and ecological education. • native waterways with animals such as bull sharks. Environment Minister Mark Speakman said the focus on native animals and indigenous culture would be a highlight. “I’m not lion, when I say this zoo will create fantastic memories for hundreds of thousands of Sydney families every year,” Mr Speakman said. The new zoo, if approved, will open in late 2017 and attract about 745,000 visitors a year. The zoo will target the growing number of international tourists visiting the west of Sydney as they travel to and from the Blue Mountains plus provide more jobs during its construction and running. The zoo is also in talks with Western Sydney University about potentially establishing a Centre of Excellence in Wildlife Conservation – a research facility housed on the Zoo site. The Department of Planning and Environment has been notified by Unity Mining that it is changing its modification application for its Dargues Reef mine to remove the proposal to use cyanide for processing gold on the site. No decision has been made on the remainder of the application. The proposal will still need to go through the normal process and be considered against stringent standards. The Department will continue to rigorously assess the company’s application in consultation with other government agencies, including the NSW Environmental Protection Authority. • constructing a vehicle crossing over Spring Creek. The company is currently preparing a response to the issues raised in submissions following the public exhibition of its application. Once that is received, the Department will finalise its assessment taking into account submissions and the company’s response and will make a recommendation to the independent Planning Assessment Commission. The final decision on the revised modification application will be made by the Commission. The Queensland Government is committed to expanding the Port of Abbot Point in a responsible and sustainable manner. The government is proposing to dredge an area needed for a new export wharf and place the dredged material on unallocated industrial land, next to the existing operational coal terminal. dredged material will not be dumped in the Caley Valley Wetlands. Queensland taxpayers will not pay for costs associated with approvals or dredging for this project. Galilee Basin project developers Adani and GVK Hancock will meet these costs. Approval for the Abbot Point Growth Gateway Project which includes dredging and the construction of dredged material containment ponds is now underway. The Queensland Government is conducting a full Environmental Impact Statement (EIS) for this project. The Queensland Government has launched public consultation on the draft Environmental Impact Statements for the proposed Abbot Point Growth Gateway Project. View the Environmental Impact Statement and have your say. If you have special communication needs, please phone 07 3452 6921. Known as the Abbot Point Growth Gateway Project, dredging and construction works for T0 are a key component of the Abbot Point port expansion. If approved, this project will allow the construction of a second trestle at the Port of Abbot Point, increase the port's capacity from 50 to 120 million tonnes per annum. This will ensure it can meet export requirements from the Galilee Basin. 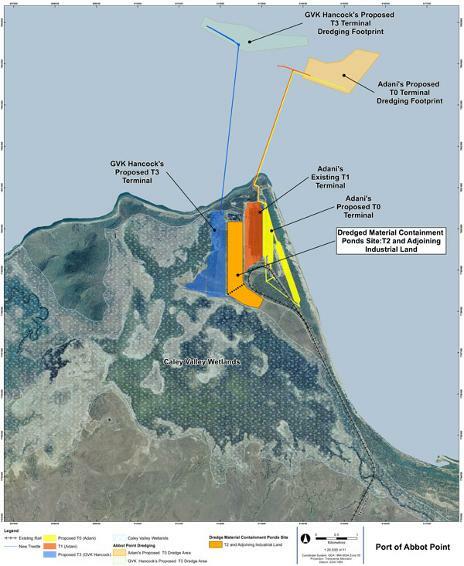 The Abbot Point Growth Gateway Project involves dredging 1.1 million cubic metres in situ of seabed. Adani's proposed dredging area is approximately 61 hectares of seabed within port limits, outside the Great Barrier Reef Marine Park. In comparative terms, the proposed dredging footprint is tiny compared to the Great Barrier Reef Marine Park's nearly 35,000,000 hectares. The proposed dredging site is 19 and 30 kilometres away from the nearest coral communities (945 KB). Scientific modelling has found that sediment will be highly localised to the dredging site and will not impact these coral communities. This dredged material will be placed on vacant industrial land ( 3.6 MB) at the port, next to the existing coal terminal. This industrial land has been previously disturbed and used for port development purposes. On-the-ground studies and investigations have been undertaken and the Environmental Impact Statement (EIS) is now available for review and comment. On 17 April 2015, the Queensland Government lodged an application with the Commonwealth Department of the Environment to begin the approval process for the Abbot Point Growth Gateway Project. The Commonwealth Government has considered this application under the Environment Protection and Biodiversity Conservation Act 1999 and determined that a full Environmental Impact Statement is required for the project. As part of this process, the draft Environmental Statement is available online, and the state government is now inviting public comment on this information. Adani, not Queensland taxpayers, is meeting the costs of the approval and investigation processes. For the latest information on the Port of Abbot Point, visit us on twitter @abbotpoint. Bushcare's Major Day Out is a national day designed to encourage us all to take part in the restoration and maintenance of our remaining bushland. Bushcare's Major Day Out is a day specifically designed to give us the opportunity to find out what is being done and what can be done in our own neighbourhood. It's a fun day where you can work alongside and learn from experts and experienced volunteers. There are a range of activities depending on the location; walks, planting, weed removal, photography workshops as well as native plant identification and well celebrated morning teas. What to bring: Wear clothes that you don't mind getting dirty and are safe and suitable for weeding and planting activities e.g. long trousers, long sleeves and sturdy shoes or boots (no thongs). Remember to bring you hat and sunglasses! Water is available but you may prefer your own supply. Free native plants for local residents! Protect our coastal environment by planting local native species adapted to the local climate. Find out about the Biodiversity Restoration of the Bilgola Creek catchment project. Receive free native plants, advice on weed control and help to identify native species. Where: North Bilgola Beach on grass area at the end of Allen Avenue. This event is being supported by Pittwater Council and the Sydney Coastal Council Salty Communities grant to help restore the Bilgola Creek catchment. For further information please call Council on 9970 1363 or 9970 1390. This year, Pittwater Council will host their popular Dog Day by the Bay at Rowland Reserve Bayview on Sunday 20 September 2015. Dog Day by the Bay will again be including agility demonstrations, education talks, competitions with great prizes to win, including the very popular Canine Fancy Dress Parade and children’s activities in kids’ corner. Come and join us for an afternoon of epic Wildlife Adventures with John Young. As a cinematographer and naturalist John Young has been filming and photographing Australia's wildlife for over 20 years. His principle area of interest is Australian birdlife and he's one of Australia's leading authorities on the subject. Over the last 20 years, he's been involved with numerous projects for television, film, books, periodicals, university studies and conservation. In May 2013, after an incredible 15 years of searching, John rediscovered the endangered Night Parrot which was thought to be extinct. John was the first person to obtain film and photographs of a living specimen. Further research is currently being performed to learn more about the biology of this mysterious bird. Come and get your hands "dirty"! Please help protect the endangered native grasslands of our coastal headlands. Fill your nostrils with salty air, enjoy the superb view and assist us to replant the native grass community. Tools, equipment and a delicious afternoon tea will be provided. Please wear comfortable clothes and closed shoes and bring a hat and water bottle. Meet: South Bilgola Headland lookout on the coastal walkway. Parking available at the Serpentine parking area or Allen Avenue. This project is being supported through the Sydney Coastal Council's Salty Communities Grant for the "Biodiversity Restoration of Bilgola Creek Catchment" during 2015 and 2016. For further information please call 9970 1363 or 9970 1390. Do you want to learn more about native bees? Pittwater Council will be holding workshops on native bees and how to keep them. Native bees are a fantastic part of our natural environment and are very seldom seen. Learn about how these communities of native bees live, breed and forage for food. Find out how and what they pollinate in your garden and what you need to do, grow and avoid in your garden to ensure a healthy hive. Can you tell the difference between a fruit fly and a Stingless bee? Tim Heard a native bee expert will be presenting his very popular workshop on keeping native bees. You will learn how to identify and keep native bees as well as how to extract honey from the hives. Two sessions of the same workshop are being held. Please choose either Session 1 - 9am to 12noon or Session 2 - 1 to 3pm. Come and join us for a spring walk through Ingleside Chase Reserve. Ingleside Chase Reserve is Pittwater's largest continuous piece of bushland. It contains many beautiful plant communities and threatened fauna. Spring is an outstanding time to experience our bushland come alive with wildlife and flowering plants. Where: Ingleside Chase Reserve (meeting point provided on booking). Bushcare planting day at Irrawong Reserve. Come and join us for a fun family morning and help plant a tree. It’s a great opportunity to get involved with this positive environmental project. This six year project, now in its 4th year, aims to protect the biodiversity of Mullet Creek and tributaries from Elanora Heights down to Warriewood through Ingleside Chase and Irrawong Reserves. Where: Meet at the end of Irrawong Road near the main walking track. Please bring a hat, water bottle and wear enclosed shoes. Morning tea provided. No bookings are required for this activity. Come and join us for a spring walk through the Warriewood Wetlands. Spring is an outstanding time to experience our wetlands come alive with wildlife and flowering plants. With a range of native vegetation communities this area provides significant habitat for many larger fauna species now lost in the Sydney region. This is a great opportunity to discover more about our amazing plants and wildlife from our expert guide. If interested you can also be part of the bushcare planting day. Where: Warriewood Wetlands and Irrawong Reserve (meet point provided on booking) Bookings Essential! As wombats fight for survival against a deadly skin disease that kills in months, University of Western Sydney scientists are asking Australians to help take a census of wombats using an innovative new app. WomSAT, launched by the University of Western Sydney, allows everyday citizens to report wombat sightings and record the animal's health. Chief investigator on the project, Associate Professor Julie Old, says wombats across the country are under threat from a parasitic mite which causes sarcoptic mange. The mites initially burrow into the skin causing the wombats to become itchy. In the longer term, they are likely to become blind, deaf and die due to the secondary effects of the infestation. Early physical signs of the infestation include missing patches of fur and scratching. "Wombats across eastern and southern Australia are dying in the thousands because of this deadly disease," says Associate Professor Old, a biologist from the UWS School of Science and Health. "To fully understand the challenges facing wombats and ensure their future survival, we need to take a comprehensive census of wombat numbers, their distribution and their health." "And the best way to adequately monitor the vast and often remote habitat of wombats is through the eyes and phones of millions of Australians." UWS is calling on everyone around the country to join the fight by using WomSAT, a new website and app allowing anyone to easily record the exact location of a wombat using a phone's inbuilt GPS. The app and website have images and text to guide people on how to identify the wombat and how to visually diagnose mange. "Wombats severely affected by mange suffer painful skin infections and are often seen during the day," says Associate Professor Old. "It's likely these wombats are venturing out during the day to spend more time foraging to compensate for the energy used scratching." "By taking the time to log onto WomSAT every time a wombat is spotted, Australians can participate in science and help monitor the population and alert experts about changes and threats to the population." WomSAT is supported by Emirates Airlines and Emirates One&Only Wolgan Valley. The WomSAT website is hosted by the NSW Department of Primary Industries. 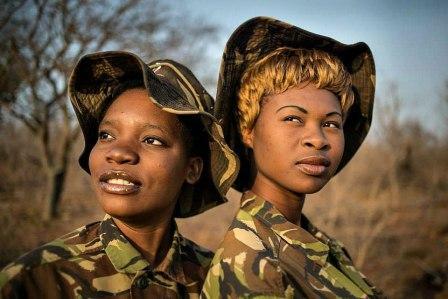 8 September 2015 – The Black Mamba Anti-Poaching Unit, a South African ranger group consisting mostly of women, has been named as one of the winners of the top United Nations environmental prize. By bestowing its Champions of the Earth award to the Black Mambas, in the Inspiration and Action category, the UN Environment Programme (UNEP) is recognizing the “rapid and impressive impact” the unit has made in combatting poaching and the courage required to accomplish this task, the agency said in a news release issued yesterday. “Community-led initiatives are crucial to combatting the illegal wildlife trade and the Black Mambas highlight the importance and effectiveness of local knowledge and commitment,”said UNEP Executive Director Achim Steiner. Since its inception in 2013, the 26-member unit has helped arrest six poachers, reduced snaring by 76 per cent, removed over 1,000 snares and put 5 poachers' camps and 2 bush meat kitchens out of action. The area that they protect, the Balule Private Game Reserve, is home to an abundance of wildlife – including not only rhino but leopards, lions, elephants, cheetahs and hippos. It is part of the Greater Kruger National Park, a network of over 2 million hectares of protected areas that is home to thousands of birds, impalas, giraffes, wildebeest, buffalos, antelopes, hyenas, crocodiles, fish and zebras. Protecting the rhino is vital in South Africa, where 1,215 rhinos were killed in 2014 alone. This is an increase of over 12,000 per cent since 2004 and symptomatic of a devastating epidemic that has pushed the rhino closer to the edge of extinction, according to UNEP. Mr. Steiner noted that while their work contributes mostly toward ecosystem preservation and halting biodiversity loss, Goal 15 of the Sustainable Development Goals, it also exemplifies the action-driven solutions needed to achieve all of the SDGs, which world leaders will adopt later this month. “With every rhino saved, the Black Mambas demonstrate that action on a local level is critical to achieving global sustainability and equity,” he stated. Leitah Mkhabela, a member of the Black Mamba rangers, said: “I am not afraid, I know what I am doing and I know why I am doing it. If you see the poachers you tell them not to try, tell them we are here and it is they who are in danger. To date, the Champions of the Earth Awards have recognized 67 laureates in the categories of policy, science, business and civil society. This year, the award year aims to support the Sustainable Development Goals by illustrating, through the examples of the laureates, that the transition to low-carbon, resource-efficient, inclusive and sustainable economic models is not just possible, but already in progress. The other winners for this year will be announced in the coming weeks and will receive their honours at a ceremony to be held at the close of the Sustainable Development Summit on 27 September in New York. I am pleased to launch the Australia-ASEAN Council, an Australian Government initiative to strengthen our links with the countries of South-East Asia. South-East Asia is the one of the most important strategic and economic regions in the world with a combined GDP of around USD$2.5 trillion and a population of over 620 million people. The 10 member nations of ASEAN now represent almost 15 per cent of Australia’s total trade, with two-way trade valued at almost $100 billion in 2014. The Australia-ASEAN Council will shape our engagement with South-East Asia and strengthen partnerships through stronger business, education, science, arts and cultural links. It will also work closely with the New Colombo Plan and Australia Alumni networks to facilitate ongoing links between individuals and organisations. Today I also announce Ms Christine Holgate, CEO and Managing Director of Blackmores, will be appointed Chair of the Council. Ms Holgate has extensive experience working in Asia, Europe, the Americas and Australia bringing strong leadership and knowledge of Australia’s trade interests in South-East Asia to the role. • Mr Gary Quinlan, Department of Foreign Affairs and Trade. The Australia-ASEAN Council (AAC), launched by Foreign Minister Julie Bishop on 8 September 2015, will generate opportunities for Australian business, education, science and innovation and the arts to work with partners in South-East Asia. The Council's mission will be to increase knowledge and promote Australia's interests in South-East Asia by initiating and supporting activities designed to enhance awareness, understanding and links between people and institutions in Australia and ten South-East Asian countries: Brunei Darussalam, Cambodia, Indonesia, Lao PDR, Malaysia, Burma, Philippines, Singapore, Thailand and Vietnam. The AAC grant round will open on Wednesday 16 September 2015. 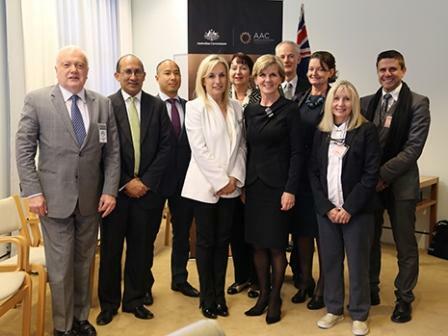 Top: The Hon Julie Bishop MP Minister for Foreign Affairs meeting with the Australia-ASEAN Council Board and DFAT Secretary Mr Varghese at Parliament House, Tuesday 8 September 2015. Photo credit: Julia Landford, DFAT. More than 1,500 Australians with type 1 diabetes will be able to access new trial therapies following the Australian Government’s commitment of $14 million in new research grants. The Minister for Education and Training, the Hon Christopher Pyne MP said the grants are the first to be assessed through the Type 1 Diabetes Clinical Research Network, an innovative clinical research programme led by the Juvenile Diabetes Research Foundation (JDRF) Australia. “The $14 million in new grants is part of the $35 million awarded to JDRF over five years through the Australian Research Council to fund the most promising research and researchers dedicated to finding a cure for type 1 juvenile diabetes and its complications,” Mr Pyne said. “These exciting trials will be delivered collaboratively by more sites than ever before across Australia, and will help improve the lives of many Australians affected by this serious chronic disease. “Today’s funding announcement will enable 1,532 Australian patients to access cutting edge trial therapies in the short term. “Taking a broader view, the hope is that these clinical trials hold the key to life-changing therapies for all people affected by type 1 diabetes, here in Australia and globally. For more information on the grants, please visit the Juvenile Diabetes Research Foundation website: jdrf.org.au. For more information about the Special Research Initiative for Type 1 Juvenile Diabetes, please visit the Australian Research Council website. 84 workplace related diseases, from skin diseases to cancer, have been listed by Safe Work Australia for consideration by the States and Territories for consideration as 'deemed diseases' under workers; compensation laws. The diseases are listed in Deemed Diseases in Australia a report released by the Minister for Employment Senator Eric Abetz today. Senator Abetz said Safe Work Australia conducted the important review of listed workplace-related diseases listing 84 deemed diseases for consideration by jurisdictions for workers’ compensation such as hepatitis, skin diseases and some cancers. “This report is significant as most of the deemed diseases lists in workers’ compensation schemes across Australia are outdated with some states relying on 1934 international standards,” Senator Abetz said. The deemed diseases list in the Commonwealth’s workers’ compensation scheme has not been updated since the introduction of the Safety, Rehabilitation and Compensation Act 1988. The Deemed Diseases list provides information to help employers and employees to prevent workplace related disease. It is also designed to streamline access to workers’ compensation for employees who suffer from a specified disease resulting from exposure to a particular risk at work. The Deemed Diseases in Australia report was commissioned by Safe Work Australia and is the first Australian review into the deemed diseases list for workers’ compensation. An independent expert in the field of epidemiology and occupational medicine, Professor Tim Driscoll, was engaged to develop the report. The development of the report was overseen by an advisory group, including representatives of the Commonwealth, state and territory workers’ compensation authorities, employers groups and unions. The need to raise awareness of the risks children face online has again been highlighted in the Australian Federal Police’s (AFP) latestThinkUKnow report. With this week being National Child Protection Week, it is important that we recognise that activities online or on your mobile phone are never 100 per cent safe. ThinkUKnow, the AFP’s primary cyber safety education program, delivered in partnership with Microsoft Australia, Datacom and the Commonwealth Bank, plays a vital role in addressing the knowledge gap between adults and children by educating Australian parents, carers and teachers about online safety. This includes serious issues such as online grooming and exploitation and cyberbullying. Keeping our children safe is everyone’s responsibility. Since the ThinkUKnow program’s inception in 2009, 1,047 cyber safety presentations have been delivered to nearly 34,000 parents, carers and teachers across Australia. In the 2014–15 financial year, 567 trained and accredited volunteers held 213 ThinkUKnow presentations, reaching 6,588 adults across Australia. These results are impressive, particularly as 97 per cent of participants agreed the presentations motivated them to take immediate action to protect themselves or their children online. An additional 2,069 youth presentations were delivered to 190,000 students on-the-ground by State and Territory police via Youth Liaison Officers, Crime Prevention Officers and volunteers to ensure law enforcement cyber safety messages are consistent across the country. The NSW Police Force was the seventh police service to join the program this year, which I announced in partnership with NSW Deputy Premier and Police Minister Troy Grant in May. The Australian Government is committed to enhancing community safety and the role of law enforcement in the online environment. That is why we established the of the Office of the Children’s e-Safety Commissioner, and the Australian Cybercrime Online Reporting Network (ACORN), a national reporting facility for cybercrime. A full copy of the ThinkUKnow Corporate Report 2014–15 can be found at www.thinkuknow.org.au/reports. For her research showing that people with dementia lose their ability to imagine the future, cognitive neuroscientist Muireann Irish has been awarded a $25,000 L’Oréal-UNESCO Fellowship. Dr Irish, an ARC DECRA fellow in UNSW Psychology based at Neuroscience Research Australia, has also discovered which parts of the brain are essential for imagining future events, such as knowing to take the keys when leaving the house, or planning a holiday. Her research is contributing to the development of practical changes in the way caregivers can interact with people with dementia to improve the quality of life of patients as well as reduce the burden on caregivers. Tomorrow, more than 300 schoolgirls will attend a Girls in Science forum at UNSW where they will meet Dr Irish and the three other fellowship winners. The school students will then tour UNSW Science laboratories, carry out a variety of hands-on experiments, and meet some of the faculty’s leading scientists, including Scientia Professor Michelle Simmons, Scientia Professor Veena Sahajwalla and Professor Angela Moles. Dr Irish, who grew up in Ireland, says her family history helped set her on her career pathway. “As a child I was always interested in memory because I found that I could remember things that a lot of my friends couldn’t. On the other hand, I watched my grandmother succumb to Alzheimer’s disease,” she says. While she has focussed so far on studying individual structures in the brain, she plans to use the fellowship to look at the whole brain and work out which neural networks are disrupted by dementia. “Ultimately, I aim to comprehensively map the neurobiological changes which underlie the devastating loss of uniquely human cognitive functions,” she says. UNSW Dean of Science Professor Merlin Crossley congratulated Dr Irish on her award. “Muireann’s groundbreaking research is helping tackle one of the biggest problems facing society and could lead to better care for people with dementia,” he said. Last year, Dr Irish won a NSW Young Tall Poppy Science Award. In 2013 she received the Dean’s Award for National Achievements in Research, and she was also the recipient this year of a Dean’s Carers Fellowship, which is offered to UNSW Science researchers whose careers have been interrupted through full-time carer status for at least six months. The other three L’Oréal-UNESCO fellows are James Cook University fish biologist Dr Jodie Rummer, CSIRO astronomer Dr Shari Breen, and University of Otago geologist Dr Christina Riesselman. The global L’Oréal-UNESCO For Women in Science program recognises accomplished female researchers and assists young female scientists progress their career. The awards have recognised more than 2250 women in 110 countries in the past 17 years. Parliamentary Secretary to the Minister for Agriculture, Senator Richard Colbeck, congratulated Tasmanian farmers who received awards at the 2015 Farmer of the Year Awards, announced at an annual awards dinner in Sydney last night. "Tasmania was very well represented at the awards night, with local farmers winning four of the nine categories. This is an excellent example of the passionate, innovative and driven people we have in our agriculture industry," Senator Colbeck said. Fifth generation Dunalley farmer, Matt Dunbabin, took out the overall award, winning the 2015 Farmer of the Year as well as the Diversification Farmer of the Year. Mr Dunbabin and his wife Vanessa produce wine, wool, beef, sheep and oysters on their 6,000 hectare farm in Tasmania's southeast. Northern Tasmanian honey producer, Lindsay Bourke, was named the Plant Biosecurity Farmer of the Year, an excellent result after also being a finalist in the competition last year. Brian and Michele Lawrence from Meander won the category for Dairy Farmer of the Year; they won the award for their commitment to environmental management and contribution their dairy farm is making to their community. "I congratulate Mr Dunbabin, Mr Bourke and Mr and Mrs Lawrence on winning the awards and for their passion and commitment to Tasmanian agriculture," Senator Colbeck said. "They are excellent examples of the many passionate, innovative and motivated people here in Tasmania and are very deserving winners." "Awards like this are a great way to recognise the contribution of people from rural and regional areas around Australia and it's fantastic to see Tasmanians well represented in this year's Farmer of the Year," Senator Colbeck said. The Australian Farmer of the Year Awards are sponsored by Kondinin Group and ABC Rural and recognise farmers and farming families for their innovation, professional management and sustainable farming businesses, while raising the profile of the important role they play in Australian agriculture. “Based on Australia Post’s proposal a $1 basic postage rate will significantly reduce the losses on Australia Post’s stamped letters by 2016-17. Further, Australia Post’s monopoly letter services (stamped and bulk business mail) are forecast to reverse their previous loss making state by 2016-17, ” ACCC Chairman Rod Sims said. "This would be a turnaround in a short period with the price increase. However, stamped letters would continue to face losses and there is uncertainty around the longer-term rate of decline in letter volumes and a risk Australia Post’s overall monopoly letter services could return to net losses,” Mr Sims said. The Australian Government recently regulated to allow the introduction of a two-speed letter service by Australia Post, which will distinguish between letters delivered at a priority and regular timetable. The ACCC does not have the role of approving the proposed price increase. Rather, the ACCC is required to assess the proposed price increase in accordance with the Competition and Consumer Act (2010) and then notify Australia Post as to whether it objects to the proposed price increase. In addition to the ACCC’s assessment, Australia Post must give written notice to the Minister for Communications of its intent to vary its rates of postage. Australia Post may increase the basic postage rate only if the Minister does not disapprove the proposed increase to the BPR within 30 days of receiving notification from Australia Post. The ACCC is seeking submissions by 15 October 2015 and will publish its response to Australia Post’s draft proposal in November 2015. The ACCC’s Issues Paper and details of how to make a submission are available at: Australia Post - letter pricing 2015. September 8, 2015 - Researchers have proven that rudeness -- like poison in the water cooler -- is toxic in the workplace, affecting both job and business performance. But what if your office is a hospital Intensive Care Unit where lives hang in the balance? A new Tel Aviv University study published in Pediatrics suggests that even the most benign forms of impoliteness may impede medical personnel's ability to perform under pressure and damage the quality of patient care. Rudeness alone accounts for a significant drop in hospital staff's diagnostic and professional performance, according to research led by Prof. Peter Bamberger of TAU's School of Management. Prof. Bamberger collaborated on the study with Dr. Arieh Riskin, also of TAU's School of Management and the Bnai Zion Medical Center in Haifa, and Dr. Amir Erez and Trevor Foulk of the University of Florida Warrington College of Business Administration. "Relatively benign forms of incivility among medical staff members -- simple rudeness -- have robust implications on medical team collaboration processes and thus on their performance as a team," said Prof. Bamberger. "This is important because rudeness is rampant in many medical contexts. Patients and their families may be rude to caregivers, and caregivers may be rude to one another." The teams were informed that an expert on team reflexivity from the United States would be observing them by live video throughout the stimulation, occasionally making suggestions over the two-way link. Half of the teams performed in the presence of a "rude" expert, whereas the other half completed their tasks under the watchful gaze of a "neutral" commentator. The expert's rudeness was expressed in a comment made before the team he was observing even got to work: "I've observed a number of groups from other hospitals in Israel, and compared to the participants observed elsewhere in the past, I can't say I'm impressed with the quality of medicine in Israel." "We hope our findings will shift the focus of research on medical error toward interpersonal interactions and cognition," said Prof. Bamberger. "From a practical perspective, we hope it will call attention to the need to shift behavioral norms in medical contexts." 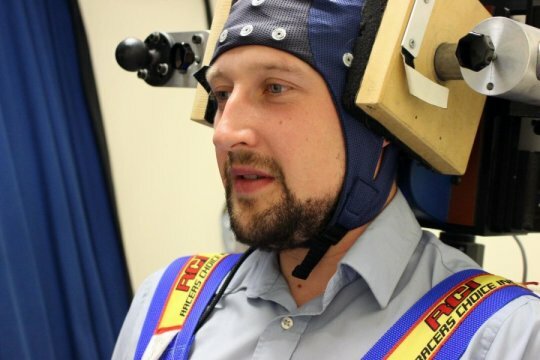 September 4, 2015 - The misery of motion sickness could be ended within five to ten years thanks to a new treatment being developed by scientists. Research from Imperial College London, published in the journal Neurology, shows that a mild electrical current applied to the scalp can dampen responses in an area of the brain that is responsible for processing motion signals. Doing this helps the brain reduce the impact of the confusing inputs it is receiving and so prevents the problem that causes the symptoms of motion sickness. Dr Qadeer Arshad from the Department of Medicine at Imperial College London led the research. He said: "We are confident that within five to ten years people will be able to walk into the chemist and buy an anti-seasickness device. It may be something like a tens machine that is used for back pain. We hope it might even integrate with a mobile phone, which would be able to deliver the small amount of electricity required via the headphone jack. In either case, you would temporarily attach small electrodes to your scalp before travelling -- on a cross channel ferry, for example." Professor Michael Gresty from Imperial College who collaborated in this study and is a world expert on motion sickness said: "The problem with treatments for motion sickness is that the effective ones are usually tablets that also make people drowsy. That's all very well if you are on a short journey or a passenger, but what about if you work on a cruise ship and need to deal with motion sickness whilst continuing to work? "We are really excited about the potential of this new treatment to provide an effective measure to prevent motion sickness with no apparent side effects. The benefits that we saw are very close to the effects we see with the best travel sickness medications available." Dr Arshad said: "From other studies we also have evidence that stimulating the brain in this way can enhance attention and concentration. This aspect is of great interest to the military and we imagine that other groups such as students and people who spend long periods playing computer games will also want to try it out. "The currents involved are very small and there is no reason to expect any adverse effects from short term use." In January 2015, scientists commissioned Australia’s first permanent ship-based labs to study the influence of both natural ocean emissions and human emissions on the composition of air over the Southern Ocean. The research will generate the most complete picture of the atmosphere over the Southern Ocean to date, and improve our ability to predict future changes to Australian weather and climate by measuring the smallest of atmospheric particles - with a diameter less than a thousandth of a human hair - which have a profound influence on both human health and climate. Scientists from QUT, the University of Melbourne, CSIRO and University of Wollongong were on board CSIRO’s new $120 million research vessel Investigator, which ventured to Antarctica’s ice edge (65 degrees South) to test how the vessel and its systems performed in frigid water temperatures. The unique data sets these laboratories will provide will give the most complete picture of the atmosphere over the Southern Ocean and significantly improve our ability to predict future changes to Australian weather and climate. Ten meteorological balloons were deployed from the ship in the demanding conditions of the Southern Ocean. Australia and our Pacific neighbours share more than an ocean; we have a common interest in regional development and security. The Pacific Islands Forum discussed practical ways Pacific Island countries can grow their economies, including through securing sustainable economic returns from their fisheries and maximising the potential of information technology. I was pleased to announce that, in addition to our $2 billion Pacific patrol boat replacement programme, Australia will provide around $19 million per year to further enhance maritime surveillance and coordination in the region. If countries can more easily identify and target illegal fishers and other transnational criminals, it will help ensure ongoing returns from Pacific fisheries. Improved internet access will help drive our region’s economic prosperity. To take advantage of this potential, we need to work together to ensure trust, confidence and stability in cyberspace. Australia will help train regional business leaders to improve their defences against cybercrime. The Pacific is particularly vulnerable to the effects of climate change. The Forum leaders agreed that the Paris climate change meeting needs to advance long-term global climate action. Australia’s contribution – an emissions reduction target of 26-28 per cent on 2005 levels by 2030 – is strong, responsible and achievable. Through actions such as these, the 46th Pacific Islands Forum has advanced the goal of a safer, stronger and more prosperous Pacific. The Australian Human Rights Commission welcomes the report of the Parliamentary Joint Committee on Intelligence and Security on the draft Citizenship Bill. The Commission made a written submission to the Committee in relation to this inquiry, and the President of the Commission, Professor Gillian Triggs, gave oral evidence before the Committee. The Commission commends the Committee for its consideration of the potential human rights implications of the Bill, and for the detailed recommendations it has made that amendments be made to the Bill before it is passed. “While the proposed amendments address many of our concerns, we believe the Bill even as amended should not be passed,” said Professor Triggs. The Commission has two key concerns. First, the Bill would still allow for automatic loss of citizenship in some circumstances. This could mean an individual’s citizenship could be revoked before their individual circumstances are properly considered. That could be arbitrary and inconsistent with the International Covenant on Civil and Political Rights. Also, the Commission is concerned that even as amended children could still lose their citizenship in particular circumstances. This would be in contravention of the Convention on the Rights of the Child. “Loss of citizenship is an extremely serious matter. All of the evidence that loss of citizenship can be necessary to protect national security was heard in-camera, and therefore the justifications for the Bill have not been tested in the public domain,” said Professor Triggs. If the Government decides to proceed with the Bill, then the Commission supports the adoption of the Committee’s recommendations, with the exception of recommendation 10. Recommendation 10 would expand the retrospective operation of the Bill. Australia will resettle an additional 12,000 refugees who are fleeing the conflict in Syria and Iraq. Our focus will be on those most in need – the women, children and families of persecuted minorities who have sought refuge from the conflict in Jordan, Lebanon and Turkey. A team of Government officials will depart for the region as soon as possible to begin identifying and processing potential candidates for resettlement. In addition, Australia will provide humanitarian support to more than 240,000 Syrian and Iraqi people who have been forced to flee their homes or seek refuge in neighbouring countries. This is expected to cost $44 million. This funding will deliver much needed food, water, healthcare, education, emergency supplies and protection, including support for women and girls. With this additional commitment, Australia’s contribution to help address the humanitarian crisis in Syria and Iraq will be around $230 million since 2011. Today’s announcement represents a significant contribution to the humanitarian crisis in the Middle East. It is a generous, prudent and proportionate response by a decent and compassionate nation. It follows consultations with the United Nations High Commissioner for Refugees and other humanitarian agencies in Geneva. Our officials will work with the UNHCR to resettle the refugees as soon as possible. They will undergo normal security, health and character checks before coming to Australia and receiving permanent protection. The 12,000 places will be in addition to the existing humanitarian programme of 13,750, which rises to 18,750 in 2018-19. This decision represents a significant increase in Australia’s humanitarian intake. We are able to make this contribution because the Coalition Government has stopped the flow of illegal boats to Australia, easing the pressure on our humanitarian programme. It will require the support of all Australian governments and community organisations. We will engage State and Territory leaders and community organisations in coming days to discuss how the nation can contribute to this effort. The Government has decided to extend Australia’s air strikes against Daesh into Syria. This marks the next phase of Australia’s contribution to the international coalition effort to disrupt, degrade and ultimately defeat the Daesh death cult. The decision to expand air operations into Syria has been given careful consideration. It follows Iraq’s requests for international assistance to strike Daesh strongholds, and a formal request from the Obama Administration. The legal basis for these operations is the collective self-defence of Iraq. The Daesh death cult does not respect borders and threatens the security of Iraq and the international community from its safe havens in Syria. Daesh controls a large amount of territory in eastern Syria that serves as a source of recruitment and oil revenues, and as a base from which it continues to launch attacks in both Syria and Iraq. From Syria, Daesh has been able to operate training bases, conduct planning and preparation for attacks, and move fighters and materiel into, and out of, Iraq. The extension of the Australian Defence Force’s operations into Syria will help protect Iraq and its people from Daesh attacks inside Iraq and from across the border in Syria. The Daesh death cult is reaching out to Australians, as terrorist incidents and disrupted attacks here have demonstrated. Australia joins a number of other nations – including the United States, Canada, Arab countries and Turkey – which are already contributing to the effort against Daesh in Syria. Australia’s Air Task Group, deployed to the Middle East region, consists of six F/A-18 Hornet aircraft, a KC-30A Multi-Role Tanker Transport and an E-7A Wedgetail Airborne Early Warning and Control aircraft. Australia remains committed to the international effort to counter Daesh, which threatens stability in Iraq and the Middle East and the security of Australians at home and in our region. As the Government has stated before, the size and nature of Australia’s overall commitment to defeat Daesh will remain under regular review. This is a decision that is firmly in Australia’s national interest. It reflects the Government’s steadfast commitment to keeping Australians safe from terrorism, preventing the spread of violent extremism to our shores and responding to a deepening humanitarian crisis. September 7, 2015 - The Stonehenge Hidden Landscapes Project reveals traces of standing stones beneath Durrington Walls super-henge. The Stonehenge Hidden Landscapes Project team, using non-invasive geophysical prospection and remote sensing technologies, has now discovered evidence for a row of up to 90 standing stones, some of which may have originally measured up to 4.5 metres in height. Many of these stones have survived because they were pushed over and the massive bank of the later henge raised over the recumbent stones or the pits in which they stood. Hidden for millennia, only the use of cutting edge technologies has allowed archaeologists to reveal their presence without the need for excavation. At Durrington, more than 4.5 thousand years ago, a natural depression near the river Avon appears to have been accentuated by a chalk cut scarp and then delineated on the southern side by the row of massive stones. Essentially forming a C-shaped 'arena', the monument may have surrounded traces of springs and a dry valley leading from there into the Avon. Although none of the stones have yet been excavated a unique sarsen standing stone, "The Cuckoo Stone," remains in the adjacent field and this suggests that other stones may have come from local sources. This new discovery has significant implications for our understanding of Stonehenge and its landscape setting. The earthwork enclosure at Durrington Walls was built about a century after the Stonehenge sarsen circle (in the 27thcentury BC), but the new stone row could well be contemporary with or earlier than this. 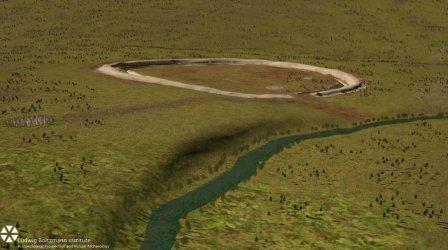 Not only does this new evidence demonstrate an early phase of monumental architecture at one of the greatest ceremonial sites in prehistoric Europe, it also raises significant questions about the landscape the builders of Stonehenge inhabited and how they changed this with new monument-building during the 3rd millennium BC. The Stonehenge Hidden Landscapes Project is an international collaboration between the University of Birmingham and the Ludwig Boltzmann Institute for Archaeological Prospection and Virtual Archaeology (LBI ArchPro) and led by Professor Wolfgang Neubauer and Professor Vincent Gaffney (University of Bradford). As part of the project, experts from many different fields and institutions have been examining the area around Stonehenge revealing new and previously known sites in unprecedented detail and transforming our knowledge of this iconic landscape. The above is reprinted from materials provided by Ludwig Boltzmann Institute for Archaeological Prospection and Virtual Archaeology. 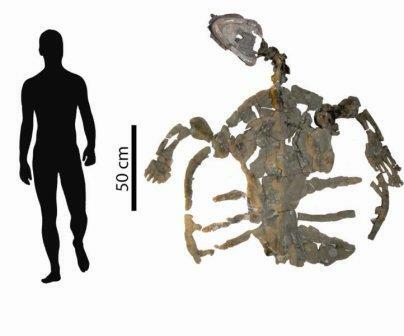 September 7, 2015 - Scientists at the Senckenberg Research Institute in Frankfurt have described the world's oldest fossil sea turtle known to date. The fossilized reptile is at least 120 million years old -- which makes it about 25 million years older than the previously known oldest specimen. The almost completely preserved skeleton from the Cretaceous, with a length of nearly 2 meters, shows all of the characteristic traits of modern marine turtles. The study was published in the scientific journal PaleoBios. "Santanachelys gaffneyi is the oldest known sea turtle" -- this sentence from the online encyclopedia Wikipedia is no longer up-to-date. "We described a fossil sea turtle from Colombia that is about 25 million years older," said Dr. Edwin Cadena, a scholar of the Alexander von Humboldt foundation at the Senckenberg Research Institute. Cadena made the unusual discovery together with his colleague from the US, J. Parham of California State University, Fullerton. "The turtle described by us as Desmatochelys padillai sp. originates from Cretaceous sediments and is at least 120 million years old," says Cadena. Sea turtles descended from terrestrial and freshwater turtles that arose approximately 230 million years ago. During the Cretaceous period, they split into land and sea dwellers. Fossil evidence from this time period is very sparse, however, and the exact time of the split is difficult to verify. "This lends a special importance to every fossil discovery that can contribute to clarifying the phylogeny of the sea turtles," explains the turtle expert from Columbia. The fossilized turtle shells and bones come from two sites near the community of Villa de Leyva in Colombia. The fossilized remains of the ancient reptiles were discovered and collected by hobby paleontologist Mary Luz Parra and her brothers Juan and Freddy Parra in the year 2007. Since then, they have been stored in the collections of the "Centro de Investigaciones Paleontológicas" in Villa Leyva and the "University of California Museum of Paleontology." Cadena and his colleague examined the almost complete skeleton, four additional skulls and two partially preserved shells, and they placed the fossils in the turtle group Chelonioidea, based on various morphological characteristics. Turtles in this group dwell in tropical and subtropical oceans; among their representatives are the modern Hawksbill Turtle and the Green Sea Turtle of turtle soup fame. "Based on the animals' morphology and the sediments they were found in, we are certain that we are indeed dealing with the oldest known fossil sea turtle," adds Cadena in summary. September 8, 2015 - If you speak English or another big language, you can talk to your mobile phone, use search engines, and get machine translation systems to do your translations for you. This has been made possible because English is a huge language with a great number of resources that linguists employ to develop language technology. People who speak Faroese, Welsh or Galician are less fortunate. "When we develop machine translation systems and search engines, we usually feed huge amounts of manually annotated texts that contain information about the function and meaning of individual words into a computer. For historical reasons, these texts have primarily been newspaper articles in English and other big languages. We do not have access to similarly annotated texts in smaller languages like Faroese, Welsh, Galician and Irish, or even a major African language like Yoruba which is spoken by 28 million people," says Professor Anders Søgaard from the University of Copenhagen. "We teach the machines to register what is translated with what in the different translations of biblical texts, which makes it possible to find so many similarities between the annotated and unannotated texts that we can produce exact computer models of 100 different languages -- languages such as Swahili, Wolof and Xhosa that are spoken in Nigeria. And we have made these models available for other developers and researchers. This means that we will be able to develop language technology resources for these languages similar to those which speakers of languages such as English and French have." Anders Søgaard and his colleagues have recently presented their results in the article '"If you all you have is a bit of the Bible" at the conference Annual Meeting of the Association of Computational Linguistics. The user-driven online encyclopaedia Wikipedia has also proved to be a highly useful source for the researchers who use its texts to develop language resources for languages where people do not have access to the new language technologies. Wikipedia contains over 35 million articles, but it is the fact that as many as 129 languages are represented by more than 10,000 articles each that the researchers find interesting as many articles concern the same concepts and topics. "If the English word 'glasses' appears in the English Wikipedia entry on Harry Potter, and the German word 'Brille' is used in the equivalent German entry, it is very likely that the two words will be represented in a similar fashion in our models which form the basis of e.g. machine translation systems. And the advantage of this model is that it can be applied to 100 different languages at the same time, including many languages that have previously been denied the language technology resources that we use every day." The method is described in the article 'Inverted indexing for cross-lingual NLP' which Anders Søgaard wrote together with researchers from Google London. The article was also presented at the Annual Meeting of the Association of Computational Linguistics. The above is reprinted from materials provided by University of Copenhagen - Faculty of Humanities. From the Film Australia Collection. Made by the National Film Board 1957. Directed by Jack S Allan. A walk around King’s Park in Perth, looking at the spring flowers.